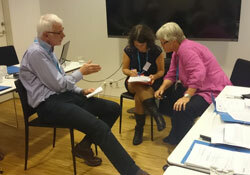 Following the initial training course for mentors on the implementation of a laboratory quality management system, according to the International Organization for Standardization (ISO) quality standard for medical laboratories (ISO 15189:2012), which took place in Copenhagen, Denmark in September 2015, the 7 identified mentors will reconvene in Copenhagen from 29 August to 2 September 2016 to participate in an advanced training course. This course will allow for the sharing of experiences gained during the first year of mentoring, along with technical updates on topics such as auditing and change management. During the first year of the mentoring project, conducted under the Better Labs for Better Health initiative, consultants worked with laboratories in Kyrgyzstan, the Russian Federation and Tajikistan on the implementation of laboratory quality management systems using the Laboratory Quality Stepwise Implementation tool, which lays the foundation for obtaining ISO 15189:2012 accreditation. During their visits, mentors give practical recommendations, help to develop action plans to overcome obstacles, perform audits and provide training on topics such as biorisk management. This work is supported by the European Union (European Commission’s Directorate-General for International Cooperation and Development) as part of the project on strengthening health laboratories to minimize potential biological risks (contract IFS/2013/332312) and the Pandemic Influenza Preparedness Framework Partnership contribution.